With contents of my studio scattered over 3 rooms, I can only work on projects either in progress or for which the four small frames close at hand will work. That has concentrated the mind wonderfully. I finished the San Jose Sharks canvas last Sunday and put it in this pretty frame. It’s hard to tell from the picture but I used 3 different blacks in it. I am almost finished with the nativity mini-angel. Because I was binge watching The Great British Bake-of (GBBO), I got three other canvases finished: a Petei wiseman, a Kate Dickerson woven ribbon canvas (my next stitch guide), below, and an Associated Talents Fleur de Lys (you’ll see it in tomorrow’s post). Today I’ll also be working on the tiny Princess & Me nativity. I hope to get at least one figure done this week. On the remodeling front. The floor in my office goes in starting Wednesday, so I have to camp out in the kitchen and work on my laptop. It should be done Saturday and next Monday I’ll post pictures of it mostly without all my stuff. 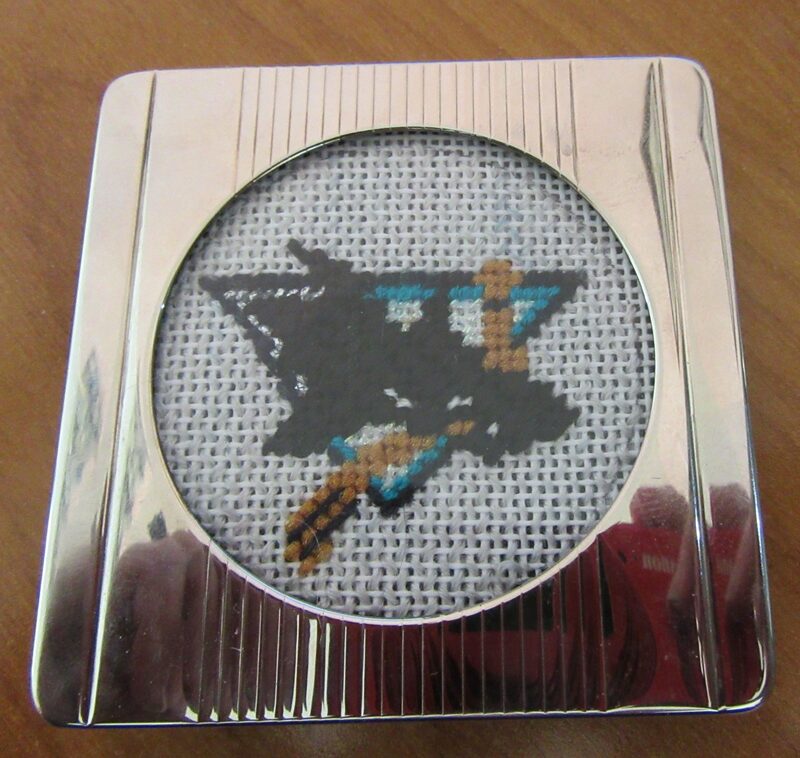 I love the frame you used for San Jose Sharks. Where did you find such a beautiful frame for something round? 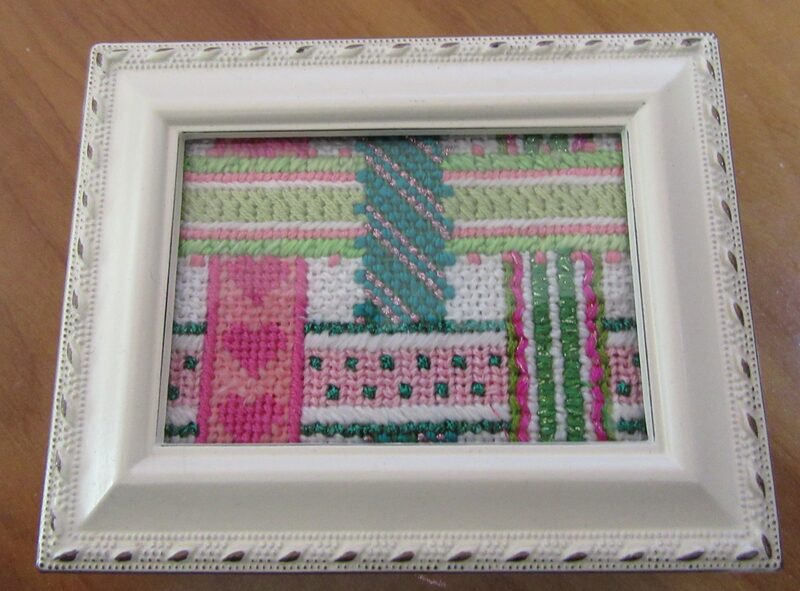 I have many projects stored because it is so hard to find round frames. Yours looks like it could also be used as a coaster. I found it on eBay. I know how hard it is to find round frames. I wanted a 3″ round frame for the striped avocado. I thought this had an opening of 3″ but actually the opening was 2″ and the outside dimension was 3″ square. It didn’t work for the avocado but it was perfect for this. For round things I stockpile stuff when I find it, so i have several of the Lee boxes (3″) a couple of white wood boxes (5″) and some round wood ornament frames originally for cross stitch (3″). Regular frames not so much.